Enjoy a 10 Night cruise to the lesser visited gems of the Caribbean and Latin America including Jamaica, Panama and Costa Rica on the 5* Island Princess. Departing Fort Lauderdale in Florida this cruise also visits Grand Cayman and historic Cartagena in Colombia. Following your flight from Dublin, you will be transferred to a hotel in Miami for your one night stay giving you a chance to relax on the famous beaches or explore this lively city. Adjectives such as glitzy and glamorous and fun and funky only hint at the reason Miami’s a world-renowned international destination. In the 500 years since Ponce de León arrived in search of the elusive fountain of youth, people have flocked here to capture the city’s energy, vitality and alluring charms. While the city’s noted for its towering palm trees, glittering blue ocean vistas and pristine beaches, beautiful weather, beautiful places and beautiful people it’s also home to an intriguing history, lively culture and postcard-perfect architecture. From the “walking trees” and ‘gator spotting in the Everglades to celebrity spotting in South Beach, Miami’s sure to impress. 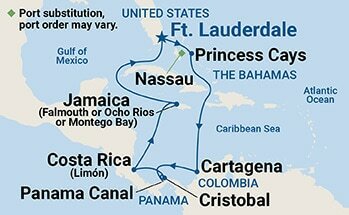 Following your overnight in Miami, you will be transferred to the port in Ft. Lauderdale to board the magnificent 5* Princess cruise ship. Falmouth is the chief town and capital of the parish of Trelawny in Jamaica. It is situated on Jamaica’s north coast 18 miles east of Montego Bay. It is noted for being one of the Caribbean’s best-preserved Georgian towns. Founded by Thomas Reid in 1769, Falmouth flourished as a market centre and port for forty years at a time when Jamaica was the world’s leading sugar producer. It was named after Falmouth, Cornwall in the United Kingdom, the birthplace of Sir William Trelawny, the Governor of Jamaica, who was instrumental in its establishment. The town was meticulously planned from the start, with wide streets in a regular grid, adequate water supply, and public buildings. It even had piped water before New York City. One of the more interesting cities on your itinerary steeped in history. This was the transit port for all the wealth Spain derived from South America. The famous “Old City” is comprised of 12 square blocks filled with attractions, boutiques and restaurants. Throughout Colombia, the Spanish Empire’s influence in the New World is self-evident. Its fortress walls, quaint narrow streets, and balconied houses are all vivid reminders of Spain’s hold on Cartagena and throughout the Caribbean and South America. This is the land of El Dorado and flamboyant adventurers in search of the ever-elusive gold. Cartagena’s well-constructed fortifications defended its borders against seafaring pirates whose attacks lasted for more than 200 years. Today this modern and bustling city, seaport, and commercial center still boasts much of its original colonial architecture. Your journey here will provide you with a significant link to the region’s grand past. **Please note that passengers may encounter numerous local vendors at various tourist locations and may find them to be persistent in their sales offers. The narrow isthmus separating the Atlantic from the Pacific Ocean had a colorful and turbulent history long before Ferdinand de Lesseps first dreamed of building a transcontinental canal. Spanish conquistadors hauled Incan gold through the dense rainforest to ports on the Atlantic. English freebooters sought to ransack those ports and attack the treasure ships that sailed from Portobelo. And 49ers braved mosquitoes and yellow fever to get to the California gold fields. While the Panama Canal remains one of the great American engineering feats of the 20th century, visitors to Panama will discover a whole range of scenic wonders. Hike into the dense rainforest, home to over 1,000 species of animals. Or pay a visit to an Embera Indian village in the heart of Chagres National Park. Costa Rica’s Limon Province boasts pristine beaches, sprawling banana plantations and dense rainforest. These Caribbean lowlands are still sparsely populated–nearly a third of the province’s population lives around Puerto Limon–and conservation efforts have led to growing eco-tourism. Limon Province offers other charms as well. Afro-Caribbean influences abound, from the lilting speech and reggae rhythms brought by Jamaican settlers to the colorful bungalows lining small fishing villages. Limon is a zesty little slice of heaven. When Columbus made his landfall in the Caymans in 1503, he found tortoises and sea turtles in such profusion that he promptly named the islands Las Tortugas. But the name that stuck for the islands was the Carib word “Caimanas.” Fitting, since the caiman is a New World crocodilian and the islands were long the lair of pirates, buccaneers, and assorted freebooters. Despite their past, the Caymans are a Caribbean demi-paradise of white-sand beaches, coral gardens, and offshore waters harboring spectacular shipwrecks. Grand Cayman, Cayman Brac and Little Cayman also boast the highest standard of living in the entire Caribbean. This union of natural beauty and cosmopolitan style makes Grand Cayman a spectacular port of call for today’s adventurers. Note: Grand Cayman is an anchorage port. Passengers transfer to shore via ship’s tender. In certain sea conditions, an alternate pier is used to transfer passengers ashore. This may cause tour durations to vary. Following your departure from the ship, you will be transferred to the airport to catch your flight home to Dublin. Island Princess is your own private retreat on the sea. Whether you crave relaxation or exhilaration, you’ll find the soothing Lotus Spa®, live entertainment, gourmet cuisine, casino gaming and more. And for a special treat, try the Bayou Café and Steakhouse, which features New Orleans-inspired Cajun and Creole cuisine. These prices are guidelines only and are subject to change and availability. Pricing will be confirmed at time of booking.